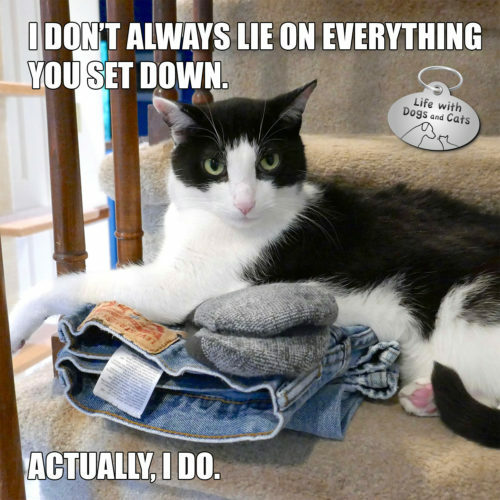 6 Comments on "I Don’t Always Lie on Everything You Set Down #MostInterestingCatInTheWorld"
Why else would things be set down if not for your comfort? Of course. There can be only one purpose. Thank you. I think the dryer warmth had disappeared by the time Calvin discovered the clothes. But they were clean and comfy, which counts for some. Calvin, you and Ellie must’ve gone to the same cat school! I imagine you’re just as hard to move as she is! Exactly! It’s hard to move a cat who has no intention of moving.